"Sydney Smith in Big Story"
Sydney Smith was born in Bedford, Quebec, on November 29, 1909. He decided to try his luck at acting, and landed roles in several of Orson Welles' Shakespeare adaptations for CBS in the mid to late thirties. Smith's big break in Radio came when he was selected to play the famous mystery writer in The Adventures of Ellery Queen during the 1943 season. 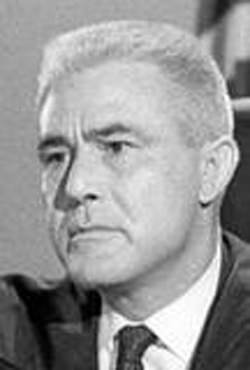 Sydney Smith was the seventh to voice Ellery Queen on CBS. Interestingly, the actors in the title role of the series seemed to get less press than the supporting cast, Santos Ortega as Detective Sgt Richard Queen and Marian Shockley as Ellery's assistant Nikki Porter. This was partly to help maintain the illusion that the "real" Ellery Queen was on the air, and it helped with the show's format of using guest "armchair detectives" in each episode. Just before the final scene, the guests would give their solution to the mystery, and then Ellery would solve the mystery. DuPont's Cavalcade of America was created, in part, to counter accusations of profiteering by the chemical company during the First World War. The long running anthology built an awesome body of work for several actors during its run from 1935 to 1953. Smith was a frequent part of the company between 1944 and the end of the run. He found more literature related mystery work on Crime Club, where the audience would come into the mysterious library to hear the weeks story of murder. On the big screen, Sydney Smith was usually seen playing bit parts as flag officers, Admirals and Generals. His most famous appearance was in No Time For Sergeants(1958), and he also appeared in Tonka(1959) and The Gallant Hours(1960). Sydney Smith passed away in Seattle in 1978.